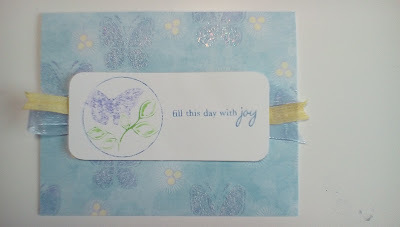 Based on Betsy's beautiful card and technique, we were challenged to create a project with an ombre stenciled background. My card is not even close to as beautiful as Betsy's, but it is cute for my first attempt at stenciling and ombre on a card. The poodle was designed to match my little Valarie, who the birthday girl this card is intended for, puppy-sat for me. Surprisingly enough, this card actually turned out really good. My ideas always seem to look better in my head than they do on paper. I started with some old Creative Memories paper and stamped butterflies which were then embossed with clear sparkle powder. The stamped focal image came out looking watercolorish. I just colored it in with markers so I'm not sure why it stamped this way, but I like it. Sorry about the pale photo, it looked fine on the camera. This challenge was to use only metallic and neutrals. I really like metallics with bright colors so this was a big challenge. I had some vellum printed with gold roses that I wanted to use and just went from there. I think I needed a bit more gold under the focal point and around the rose vellum, but my Mom will love it anyway. This challenge was to use a stamp set that had never seen ink. Unfortunately I have lots of those. One of my new goals is to use all my stamps and get rid of the ones I am not crazy about. Now I have one less set to explore. I adored Vintage Picnic as soon as it debuted, but the image was so small I wasn't sure how to use it. After looking at some PTI cards, I decided on layering. The next time I make a card like this I will move the sentiment further down and use either vintage or bright colors, but not both. Although I love the ombre effect, I am not very good at creating it. 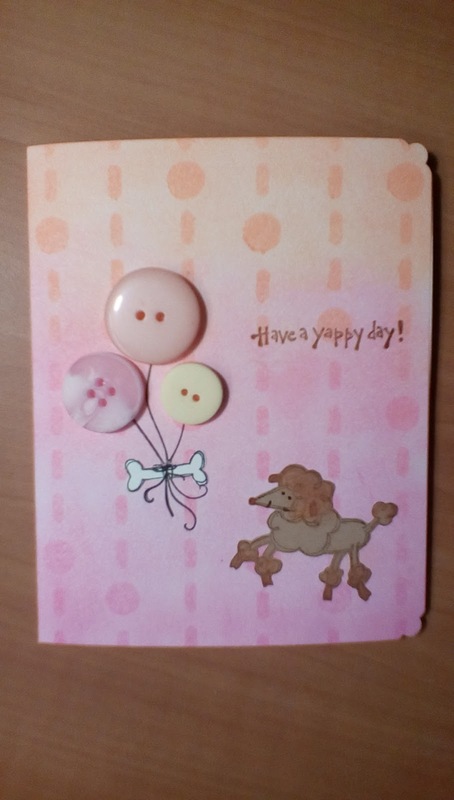 For this challenge, I decided to go with ribbon and buttons. The '1' is for my great-nephew (now I really feel old!) who will be one in August and is the only boy in the family. If I could do it over, I think I would have mounted the buttons on a cardstock 'one' so they didn't blend in quite so well. You also need a heavy cardstock for the base since the front gets very heavy. I may try this again in other colors since I have way more ribbon than any one person can use. This gift tag challenge had me at a loss for quite a while. I suddenly realized that I could make a Christmas tag even in February (I am a bit too literal sometimes :). After going through my gift bag stash, I chose a red and white snowflake bag and created a tag to match. It is a bit busy for my taste and if I had more time I would probably redo the striped backing, but it certainly matches the bag. This Challenge was to select one of the provided Color Recipes and one of the provided Sketch recipes to create a card. I had these little tags that were the backing for some Prima stamps. They went very well with the colors below . . . I adjusted the sketch a bit and came up with this festive card. I am a newlywed, a Christian and a crafter. I love vintage, classic, art deco, Chicago and anything with poodles. My husband, Kevin, and my two miniature poodles, Lisa Ljiljana and Sally Susanna, keep me busy and happy.